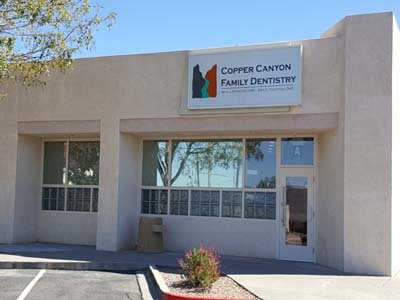 At Copper Canyon Family Dentistry, our mission is to partner with you and the community to promote oral health, and ultimately systemic health, by providing ethical, evidence-based and high quality comprehensive care with the most current technology in a friendly and gentle environment. Please check out all the resources on our website to learn more about dentistry and our office. With technology and efficient scheduling, we can provide dental work with less appointments and more importantly less injections using One Visit Dentistry and a team of dentists under one roof. We discuss your options for treatment and give you the patient education resources as well as costs up front so that you can make the best decision for your health. A lot of time, effort, and expense was put into creating a relaxed dental experience whether it is the welcoming décor, massage dental chairs, or the advanced training and personalities of our staff. Treatments are based on the most up to date proven knowledge, techniques, and modern technology so that you know you will receive the best care possible. Compared to local offices, our fees are very reasonable to better fulfill our mission of providing care to families and our community. Financing options are available, so that needed treatment is not delayed.